Students enrolled in the Bachelor of Science in Human Centered Design & Engineering complete 180 credits to graduate, including 88 credits of general education courses, at least 83 HCDE core and elective courses, and additional free electives. 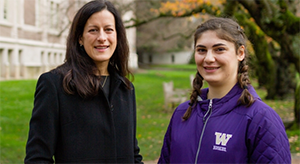 The College of Engineering's Mentors program helps student connect with peers and alumni who can offer perspective on courses, programs and life after graduation. Visit the College of Engineering Mentors page and choose either the Student or Alumni tab at the top to begin your search. Note: UW NetID login required to view mentor info.